HONOURED – Moira Lassen was awarded this week for becoming the first woman elected to the IWF executive board. A former Whitehorse resident, and mother of the Yukon's top weightlifter, was honoured for her own successes at the 30th anniversary celebrations of women's weightlifting at a ceremony in Wroclaw, Poland. Moira Lassen, the mother of former Olympic weightlifter Jeane Lassen, received a special award at Sunday's celebration for becoming the first woman elected to the International Weightlifting Federation's executive board earlier this year. Lassen was the first female elected to the board in the association's 108-year history. 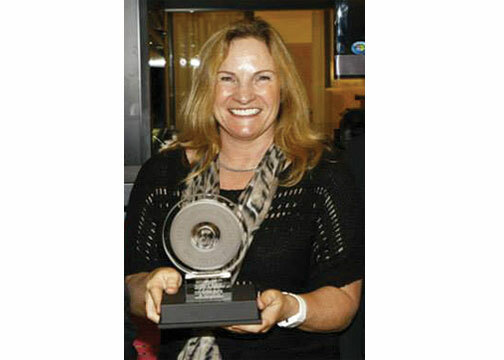 Lassen was one of eight women honoured as the IWF marked 30 years of women's weightlifting. In 1983, the IWF's executive board unanimously agreed to take control of women's weightlifting and paved the way for female athletes' entry into the sport. Considered a novelty at the time, women showed great determination to participate in the sport, traditionally considered as masculine. The first international women's tournament was held in Budapest, Hungary March 23, 1986. This was followed by world and continental championships of all age groups until in 2000, the big dream came true – women's weightlifting was finally included in the Olympic program, making its debut in Sydney, Australia. Lassen was the sole Canadian among the women honoured Sunday. Others receiving awards for their outstanding contributions to women's weightlifting included Judy Glenney (USA) – founder of the women's weightlifting movement; Liu Chunhong and Chen Yanqing (CHN) – only two-time Olympic champions; Celsa Alvarez (ESP) – first female technical official; Boossaba Yodbangtoey (THA) – 2013 IOC Women and Sport Award winner; Reiko Chinen (JPN) – pioneer female technical official; and Yang Su-Kuan (TPE) – participant in the first women's world championships in 1987. Irena Szewinska, International Olympic Committee member for Poland, received a certificate of appreciation for having contributed to the IOC's original decision to accept women's weightlifting for the Olympic Games. Lassen has a long and storied involvement in the sport, formerly serving as the secretary general of the Canadian Weightlifting Federation. She also served as chair of the Canadian Association for the Advancement of Women and Sport and Physical Activity (CAAWS). She has served at a variety of international events, including the Olympics, Youth Olympics, Pan Am and Commonwealth Games as a technical official. Locally, Lassen served as the Yukon Weightlifting Association's president for more than a decade prior to 2009, when she left the territory. Lassen was elected to the IWF's executive board after the association's congress agreed to a constitutional change to ensure a female presence would be named to the 22-member executive board. Lassen beat out three other nominees from Japan, Denmark and Austria. Her daughter, Jeane, recently retired from the sport. She competed in the 2008 Olympics in Beijing, placing eighth in the 75-kg category.